Hello everyone! Welcome to Our Daily Bread designs May Release Blog Hop! The hop will run from May 1 through Monday, May 3 at 8PM Eastern Time. The winners will be announced on the ODBD blog on Tues. May 4. We have a special "May Day" blog hop for you this month! When I was growing up in New England, on May first, we used to make "May Baskets" for our neighbors and friends,fill them with flowers or other little gifts,and then go hang them on their doorknob, knock or ring the bell, and run and hide until they had found their basket. It was such a fun "giving" tradition! Some still carry on this tradition, and others are trying to revive it. So for our hop, you are going to collect flowers from each designer to fill your May basket! If you got here from Kathy's Blog, you are in the right place! If not, you might want to go to the ODBD Blog and start from there so you don't miss anyone! There will be three winners for this hop. Each winner will receive a $15.00 store credit toward stamps at the Our Daily Bread designs store! 1. Hop from blog to blog, leaving a comment and collecting the flower that designer is giving away. 2. Return to the ODBD blog and leave a comment that you completed the hop and left comments for each designer. If you were unable to leave a comment for any one, just state their name in this comment and you will still be entered into the drawing. This is meant to be fun, not stressful. 3, Send me an email at gnywening@yahoo.com giving me the names of the designers and the flowers you collected. If for any reason you get lost along the way, just return to the ODBD Blog for the list of names. I have used the May 1 release set, In God's Hands. I love the sentiments in this set! In my photo it is hard to make out the verse, but it reads "I will not forget you! Behold, I have inscribed you on the palms of my hands." Es. 49:11 Isn't that a wonderful thought? When you think of the nail scars on Jesus' hands, picture YOUR name inscribed there! He did that for each one of us! I stamped the hand image with VersaMark, and then the verse over top and embossed it all in Gold EP. I used a simple layout, because I wanted the impact of the verse and image to take center stage, and the cross just reminds us how He inscribed us on the palms of His hands. Love this set! Designer Paper: The Paper Co.
Beautiful card, so elegant. Your crativity is amazing! This is stunning Grace!! I just love the cross and all the gold!! So elegant and it frames that beautiful verse gorgeously!! My post is up and the links are changed so everything is set. Talk to you when I get back!! Grace this is stunning! Love all the gold and the cross element! Hi Grace...this is just STUNNING...hugs to you! So very beautiful Grace! The gleam of the gold, along with your precious design, makes this one gorgeous card! Grace, as usual, your card is beautiful. I love the gold. Thank you for sharing your beautiful golden card! GASP!! Grace, this is so elegant and beautiful and powerful!!! You are one talented lady!! God Bless!!! This gold makes this image stunning,awesome work. The crosses make this card really outstanding. Great card!! Grace, your card is just beautiful. I love, love, love the verse. Awesome, Grace! Wonderful verse highlighted with that terrific image and beautiful colors of gold!!! Beautiful! Very Inspirational. It makes me eager to use my cross in such an awesome way! Grace, this is just so stunning! LOVE the gold...gives this card such a regal look! Totally GORGEOUS, oh my wow......LOVE the gold! How beautifully elegant! That gold is so eye catching and it is just gorgeous. It quite literally takes my breath away. God Bless you. Very stunning card. Love how you layered the cross using gold. BEAUTIFUL!!! Awesome card! Love the gold, the cross, and that wonderful verse! Stunningly B -U - T - FUL ! ! ! Gorgeous, Grace! The gold is bright and beautiful! Grace, what an elegant way to shine the light on the hand of God. I am so glad that He will never forget us and that I am being held by His hand. What a great way to journey through life. Thanks for the inspiration and have a wonderful weekend. What an amazing work of art, Grace! I love the color and the texture. This is so elegant and regal. Hi Grace! happy release day! What a gorgeous card you have made! What a lovely way to start your day. Love this blog hop. It has really been a wonderful and thoughtful inspiration. Your card is truly amazing. Love the insiration and how gorgeous you have portrayed it. Love the cross. 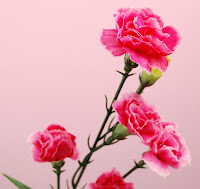 Thanks for sharing and thank you for the beautiful carnations. This is the MOST beautiful card I've ever seen! FABULOUS job, Grace! Stunning card Grace. The gold colors go perfect with the scripture. Amazing card. I love the colors and teh verse. So perfect. Thank you for sharing it. Love your use of metallics; looks so rich and elegant. I saw this beautiful metallic card in the SCS gallery, in spite of that wretched thumbnail issue. I've always liked that verse, and the chorus from it. It's one I've learned in French, too. gorgeous card - beautiful verse to remember and hold dear. What an elegant card! I love the colors, the layout, the beautiful cross and the powerful verse! Bless you for sharing your talent and your witness. WOW, love all the glitz,And a powerful message to hold on to!! Amazing. The message is powerful. Grace your card is just SO pretty! I love the gold on it and the pretty paper and ribbon! OK..I LOVE it all! LOL!! WOW!! that is gorgeous. I think I need that set! Grace this is beyond breathtaking!! I love all the regal details - and as always you've arranged the elements so masterfully!! The first word I think of when I see this card is MAGNIFICENT!!! Well done Grace! i just love the spellbinders cross. i love how you have incorporated it in your card. the card is just so regaal looking. Oooh!! Love the majestic look of your gold!! You make the most beautifully artistic cards, Grace!! Your card is absolutely elegant. As usual, I am awed by your sense of design and inspiration. I absolutely love that verse in this set Grace. Beautiful golden touches and such an elegant card! So pretty. The touch of gold really adds a ton of elegance. I love your card. The effect of the verse over the stamped hands is wonderful. Beautiful card. Love the gold cross and the lovely verse too. Wonderful work. Thanks for sharing. I love the gold you used on this card. It points us to the richness of all that God has done for us! Beautiful card! Ohhh Grace - this card is fit for royalty! STUNNING! TFS! What an elegant take on this beautiful stamp set. I like how you put the verse right over His hand. Beautiful! Oh Grace wow! You never let me down when I see your work! Just beautiful! I just got this spellbinder and haven't used it yet. Now I am really inspired! This is just beautiful! Beautiful design and I love the gold accents! Wonderful scripture card! Just beautiful, but all of your work is that way. Do you ever have a bad card day? Wonderfully done! This is a gorgeous card, a real eyecatcher! What an elegant card!! Very pretty. What a perfect card! Just lovely!! Just fabulous with the gold and white. Love it! Very elegant. That ribbon is perfect for your card. Absolutely gorgeous card! The gold is the perfect color choice, and the cross is the perfect embellishment. I love the image with the verse stamped over it. I never really noticed that verse before, but I LOOOVVE it! Hi Grace, love the embossing you have done. Really effective! Oh, the card is so stunning. Absolutely Beautiful. Your golden card is beautiful and so are the lovely pink carnations! Your card in simply breathtaking. Thanks for the carnations. Lovely card, such beautiful gold colours. I love this gold and white combination....it looks so elegant and charming!! Thanks for sharing!! This is stunning. I love your blog, it inspired me to create (after church) you have a new friend in Idaho and a fellow sister in Christ. God bless you for sharing your faith also! This is an elegant card...I need to get this set...I just love what you did with it. very nice, love the cross and the gold used. Beautiful card reminding us of what He has done for us. What a beautiful layout. Such an inspiring card. I have been admiring the Spellbinders cross set...it was great to see it in use! Thank you so much for reminding us of his great gift to us with this lovely creation. Gorgeous card. Have always loved that verse. BTW, alway love the music when I stop by your blog. Such an elegant card! Love this set. Lovely card! I love how regal it looks with the gold! Stunning! I love the first card with the cross on it. Also the music is wonderful. I have just gotten home from a funeral today. What a wonderful sympathy card this would be. Oh, the gold and white are so elegant. I love this card. Hi Grace, This is such an elegant and beautiful card! 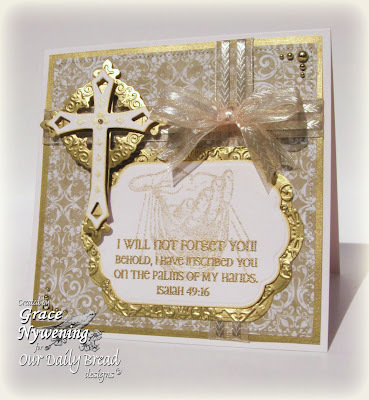 The gold & cream, combined with the cross & sentiment make this such a lovely card. These cards are all so beautiful, how can any one pick just one! Not me. I'll be spending some money, I can see.... Thank you so much for all the inspiration to a new card maker! OH wow, one of your best cards EVER!!! What a strikingly simple but elegant card! Of course, I am partial to anything with gold embossing! Those are three words that I would use to describe this fabulous card. I love those words, and the idea behind them. I have never thought about my name being on His hands. POWERFUL, indeed. Grace, you seem to always find a way to out-do your self. I can't figure out how! But, you do!